The article tells you how to navigate in straight lines over long distances over water. 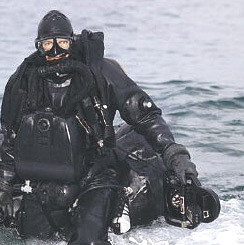 We look into what combat divers use to carry out their mission and adapt it to our own needs. Have you ever tried any form of under water navigation? Maybe you are a PADI certified advanced diver. One of the dives you had to do to get your advanced cert was underwater navigation. You learned how to hold the arm with the compass bent 90 degrees grabbing the other arm and then you swam about 20 meters towards your target. Most likely you found it, at least if you were in muddy waters, to be quite hard. So then you think about if you had to do the same thing for a mile and realize that what you learned won't do the trick. Then it is time to see what the professionals are using. Look at the picture below and try to figure out what the diver is carrying in his left hand. It probably looks like a small tray with a handle with some gadgets attached. 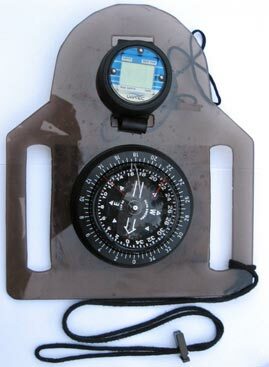 In fact the device is called a Tac-Board or Diver Navigation Board as the manufacturers RJE prefers to call it. If we look closer on it we will see that it actually contains a depth gauge, a watch and a compass. Above the compass there is also a small holder for a cyalume rod to illuminate the compass at night. So if you want to navigate as good as the US Navy SEALs but have no US Navy to provide you with the tools you can easily make your own version quite easily. You basically just need some plexiglass, a big naval compass and some tool to cut out the desired shape. When you are finished cutting out the shape you can attach any tools that you find useful when diving. 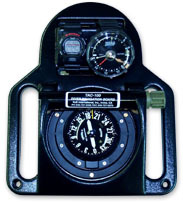 On the frontside you can see a simple divecomputer attached on top showing divetime and depth, a big compass with rotating frame below and a cord to attach to your wrist. On the backside this Tac-Board has a rugged up plexiglass piece to be use a slate to write on. Keep a pencil secured with a small cord attached as well and you have an excellent logging and communication tool. 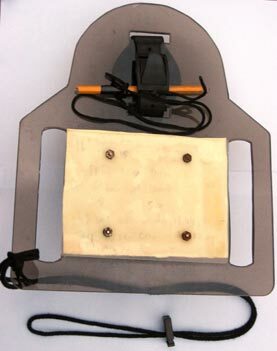 This board also have a self illuminating sheet under it to provide light in the darkness.